Forefoot Cadaver Surgical Skills Course is organized by The Podiatry Institute, Inc. and will be held from May 02 - 05, 2019 at The Podiatry Institute, Decatur, Georgia, United States of America. This Course has been approved for a maximum of 28.0 Continuing Education Contact Hours. Course Description: The Technical Training Courses have an emphasis on cadaver surgery. During the first day surgical cases are observed and an in-depth hands-on internal fixation lab is taught using bone models. Procedures range from 5th digit arthroplasties to complex rearfoot fusions. Each participant receives the use of power equipment and internal fixation. The instruction during the labs is available on both a group and individual level. Additional time is provided to allow for exploratory dissection, or additional practice of previous procedures. Throughout the course, surgical topics are discussed and participants are encouraged to bring individual cases to discuss with the faculty. All courses are Thursday through Sunday. There is a limit of 16 attendees for each course, so please call ahead to check availability. Click the links below for more information. Scientific Objectives: • To increase the attendees comfort with performing common podiatric forefoot and basic rearfoot surgical procedures through live surgical observation and hands on participation with cadaver limbs. • Identify weaknesses in attendees surgical technique and improve those skills through hands on participation with cadaver limbs and other manual skills labs. • Learn multiple, alternative options for fixation of osteotomies and/or fractures • Expose the surgeon to new surgical techniques and latest trends to increase the attendees armamentarium of surgical procedures and techniques • Establish understanding of pre-op indications and criteria for surgical procedures to improve selection of the appropriate procedure • Decrease potential of post-op complications by increasing attendees understanding of proper surgical technique and choice of fixation • Refresh knowledge on hospital protocol for inpatient and ER patients through participation in hospital rounds • Improve practice management skills by group discussions Additional details will be posted as soon as they are available. 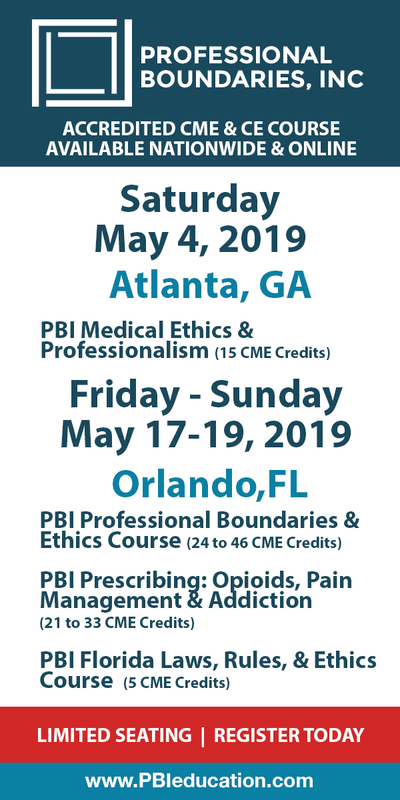 Ethical Principles in the Practice of Georgia Mental Health Professionals is organized by PESI HealthCare and will be held on May 17, 2019 at Courtyard by Marriott Atlanta Decatur Downtown/Emory, Decatur, Georgia, United States of America. Target Audience • Counselors • Social Workers • Psychologists • Case Managers • Addiction Counselors • Therapists • Marriage & Family Therapists • Nurses • Other Mental Health Professionals Course Description: Many continuing education ethics programs are generic in nature. Many continuing education ethics programs stress risk management strategies to the detriment of the attendees, especially if an attorney presenter is involved. This program is different. Rather than avoiding clinical issues, this program explores the manner by which clinical and ethical issues affect the everyday practice of the mental health professional in Georgia. This unique blend of clinical and ethical concerns allows for a more meaningful understanding and interpretation of the rules that govern mental health practice. These goals are reached through the experience and the interactive style of the presenter, Allan M. Tepper, J.D., Psy.D. Different from other individuals who possess joint degrees in psychology and law, Dr. Tepper actually maintains an active psychology practice and an active law practice. He functions as a clinician, and he represents mental health professionals who experience legal difficulties. In this regard, Dr. Tepper brings an extremely unique perspective to the practical understanding of ethics. These goals also are reached through the manual utilized in this seminar. The manual materials are not generic in nature. All of the written materials are state specific to Georgia. When interacting with an attorney, it sometimes is difficult to hear the words, “Trust me.” For this seminar, however, we do say, “Trust us! !” We guarantee, you won’t walk away disappointed. Objectives: • Determine specific state and administrative laws that are pertinent to establishing and maintaining an ethical clinical practice. • Develop policies on ethical issues such as restraints, seclusion and informed consent. • Determine which notes, documents, reports, forms, and clinical data constitute an official medical record in the state of Georgia. • Evaluate your current record-keeping practices in order to ensure compliance with ethical and legal requirements in the state of Georgia. • Designate the treatment provider’s responsibilities relating to mental health issues and duty to warn law in Georgia. • Explore the legal and ethical considerations for the treatment of minor populations in Georgia with regard to age of consent, confidentiality and custody concerns. Additional details will be posted as soon as they are available. Forefoot Cadaver Surgical Skills Course is organized by The Podiatry Institute, Inc. and will be held from Jun 06- 09, 2019 at The Podiatry Institute, Decatur, Georgia, United States of America. This Course has been approved for a maximum of 28.0 Continuing Education Contact Hours. Course Description: The Technical Training Courses have an emphasis on cadaver surgery. During the first day surgical cases are observed and an in-depth hands-on internal fixation lab is taught using bone models. Procedures range from 5th digit arthroplasties to complex rearfoot fusions. Each participant receives the use of power equipment and internal fixation. The instruction during the labs is available on both a group and individual level. Additional time is provided to allow for exploratory dissection, or additional practice of previous procedures. Throughout the course, surgical topics are discussed and participants are encouraged to bring individual cases to discuss with the faculty. All courses are Thursday through Sunday. There is a limit of 16 attendees for each course, so please call ahead to check availability. Tentative Course Topics: HAV; Distal 1st Met-Osteotomies; 1st Metatarsal Base Wedge; Lapidus Arthrodesis; 1st MPJ Fusion; HIPJ Fusion; Akin Osteotomy; Hammertoe Correction; Surgical Approach to Lesser Metatarsal Surgeries; Flexor Plate Repair; Digital Flexor Tendon Transfer; Plantar Fascia Surgery; Neuroma Excision – Dorsal Approach & Plantar Approach; Tailors Bunionectomy Procedures; Syndactylization; Heel Spur Resection Scientific Objectives: • To increase the attendees comfort with performing common podiatric forefoot and basic rearfoot surgical procedures through live surgical observation and hands on participation with cadaver limbs. • Identify weaknesses in attendees surgical technique and improve those skills through hands on participation with cadaver limbs and other manual skills labs. • Learn multiple, alternative options for fixation of osteotomies and/or fractures • Expose the surgeon to new surgical techniques and latest trends to increase the attendees armamentarium of surgical procedures and techniques • Establish understanding of pre-op indications and criteria for surgical procedures to improve selection of the appropriate procedure • Decrease potential of post-op complications by increasing attendees understanding of proper surgical technique and choice of fixation • Refresh knowledge on hospital protocol for inpatient and ER patients through participation in hospital rounds • Improve practice management skills by group discussions Additional details will be posted as soon as they are available. Vestibular Rehabilitation: Evaluation and Management of Individuals with Dizziness and Balance Disorders - Session 4 is organized by Education Resources, Inc. (ERI) and will be held from Jul 20 - 21, 2019 at Emory Decatur Hospital, Decatur, Georgia, United States of America. The target audience for this medical event is PTs, PTAs, OTs, OTAs. This CME Conference has been approved for a maximum of 13.5 Contact Hours (1.35 CEUs). Course Description: Symptoms of dizziness are the number 3 reason individuals over the age of 65 seek medical attention. It becomes the number 1 reason for seeking care in individuals over the age of 70. Medical or surgical management is often not indicated or helpful, but many of these individuals do benefit from vestibular rehabilitation techniques. In addition, 50% of the individuals over the age of 65 with dizziness will develop a particular form of vertigo that can be alleviated with one simple therapy treatment. These individuals with vertigo and dysequilibrium represent a large patient population for physical and occupational therapy. This course will focus on the assessment and treatment of patients with vertigo and disequilibrium from vestibular causes. Specific emphasis will be placed on the assessment and treatment of unilateral and bilateral vestibular hypofunction, benign paroxysmal positioning vertigo, central vestibular disorders, and multisensory dizziness. This information is applicable to a large patient population including geriatric patients as well as individuals with CNS lesions such as multiple sclerosis, CVA, and head injury. We have listened to your feedback and have developed an Advanced Vestibular Rehabilitation Online Series to serve as days 3 and 4 of this course. We hope you will take your skills to the next level with this engaging series taught by international expert Richard Clendaniel. • Cervicogenic Dizziness Online • Advanced BPPV and • What to do When It's Not BPPV: Challenging Vestibular Disorders Including Post Concussion Syndrome Additional details will be posted as soon as they are available. Rearfoot & Ankle Cadaver Surgical Skills Course is organized by The Podiatry Institute, Inc. and will be held from Aug 01 - 04, 2019 at The Podiatry Institute, Decatur, Georgia, United States of America. This Course has been approved for a maximum of 28.0 Continuing Education Contact Hours. Course Description: The Technical Training Courses have an emphasis on cadaver surgery. During the first day, surgical cases are observed and an in-depth hands-on internal fixation lab is taught using bone models. Procedures range from 5th digit arthroplasties to complex rearfoot fusions. Each participant receives the use of power equipment and internal fixation. The instruction during the labs is available on both a group and individual level. Additional time is provided to allow for exploratory dissection or additional practice of previous procedures. Throughout the course, surgical topics are discussed and participants are encouraged to bring individual cases to discuss with the faculty. All courses are Thursday through Sunday. There is a limit of 16 attendees for each course, so please call ahead to check availability. Click the links below for more information. Scientific Objectives: • To increase the attendee's comfort with performing common podiatric forefoot and basic rearfoot surgical procedures through live surgical observation and hands-on participation with cadaver limbs. • Identify weaknesses in attendees surgical technique and improve those skills through hands-on participation with cadaver limbs and other manual skills labs. • Learn multiple, alternative options for fixation of osteotomies and/or fractures • Expose the surgeon to new surgical techniques and latest trends to increase the attendee's armamentarium of surgical procedures and techniques • Establish an understanding of pre-op indications and criteria for surgical procedures to improve the selection of the appropriate procedure • Decrease potential of post-op complications by increasing attendees understanding of proper surgical technique and choice of fixation • Refresh knowledge on hospital protocol for inpatient and ER patients through participation in hospital rounds • Improve practice management skills by group discussions Additional details will be posted as soon as they are available. Forefoot Cadaver Surgical Skills Course is organized by The Podiatry Institute, Inc. and will be held from Oct 03 - 06, 2019 at The Podiatry Institute, Decatur, Georgia, United States of America. This CME Conference has been approved for a maximum of 28.0 Continuing Education Contact Hours. Course Description: The Technical Training Courses have an emphasis on cadaver surgery. During the first day, surgical cases are observed and an in-depth hands-on internal fixation lab is taught using bone models. Procedures range from 5th digit arthroplasties to complex rearfoot fusions. Each participant receives the use of power equipment and internal fixation. The instruction during the labs is available on both a group and individual level. Additional time is provided to allow for exploratory dissection or additional practice of previous procedures. Throughout the course, surgical topics are discussed and participants are encouraged to bring individual cases to discuss with the faculty. All courses are Thursday through Sunday. There is a limit of 16 attendees for each course, so please call ahead to check availability. Scientific Objectives: • To increase the attendees' comfort with performing common podiatric forefoot and basic rearfoot surgical procedures through live surgical observation and hands-on participation with cadaver limbs. • Identify weaknesses in attendees surgical technique and improve those skills through hands-on participation with cadaver limbs and other manual skills labs. • Learn multiple, alternative options for fixation of osteotomies and/or fractures • Expose the surgeon to new surgical techniques and the latest trends to increase the attendees' armamentarium of surgical procedures and techniques • Establish an understanding of pre-op indications and criteria for surgical procedures to improve the selection of the appropriate procedure • Decrease potential of post-op complications by increasing attendees understanding of proper surgical technique and choice of fixation • Refresh knowledge on hospital protocol for inpatient and ER patients through participation in hospital rounds • Improve practice management skills by group discussions Additional details will be posted as soon as they are available. Forefoot Cadaver Surgical Skills Course is organized by The Podiatry Institute, Inc. and will be held from Oct 31 - Nov 03, 2019 at The Podiatry Institute, Decatur, Georgia, United States of America. This Course has been approved for a maximum of 28.0 Continuing Education Contact Hours. Course Description: The Technical Training Courses have an emphasis on cadaver surgery. During the first day surgical cases are observed and an in-depth hands-on internal fixation lab is taught using bone models. Procedures range from 5th digit arthroplasties to complex rearfoot fusions. Each participant receives the use of power equipment and internal fixation. The instruction during the labs is available on both a group and individual level. Additional time is provided to allow for exploratory dissection, or additional practice of previous procedures. Throughout the course, surgical topics are discussed and participants are encouraged to bring individual cases to discuss with the faculty. All courses are Thursday through Sunday. There is a limit of 16 attendees for each course, so please call ahead to check availability. Scientific Objectives: • To increase the attendees comfort with performing common podiatric forefoot and basic rearfoot surgical procedures through live surgical observation and hands on participation with cadaver limbs. • Identify weaknesses in attendees surgical technique and improve those skills through hands on participation with cadaver limbs and other manual skills labs. • Learn multiple, alternative options for fixation of osteotomies and/or fractures • Expose the surgeon to new surgical techniques and latest trends to increase the attendees armamentarium of surgical procedures and techniques • Establish understanding of pre-op indications and criteria for surgical procedures to improve selection of the appropriate procedure • Decrease potential of post-op complications by increasing attendees understanding of proper surgical technique and choice of fixation • Refresh knowledge on hospital protocol for inpatient and ER patients through participation in hospital rounds • Improve practice management skills by group discussions Additional details will be posted as soon as they are available. Rearfoot & Ankle Cadaver Surgical Skills Course is organized by The Podiatry Institute, Inc. and will be held from Dec 12 - 15, 2019 at The Podiatry Institute, Decatur, Georgia, United States of America. This Course has been approved for a maximum of 28.0 Continuing Education Contact Hours. Course Description: The Technical Training Courses have an emphasis on cadaver surgery. During the first day, surgical cases are observed and an in-depth hands-on internal fixation lab is taught using bone models. Procedures range from 5th digit arthroplasties to complex rearfoot fusions. Each participant receives the use of power equipment and internal fixation. The instruction during the labs is available on both a group and individual level. Additional time is provided to allow for exploratory dissection or additional practice of previous procedures. Throughout the course, surgical topics are discussed and participants are encouraged to bring individual cases to discuss with the faculty. All courses are Thursday through Sunday. There is a limit of 16 attendees for each course, so please call ahead to check availability. Scientific Objectives: • To increase the attendees' comfort with performing common podiatric forefoot and basic rearfoot surgical procedures through live surgical observation and hands-on participation with cadaver limbs. 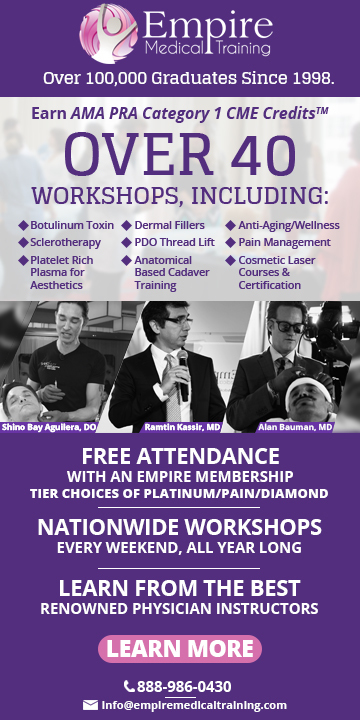 • Identify weaknesses in attendees surgical technique and improve those skills through hands-on participation with cadaver limbs and other manual skills labs. • Learn multiple, alternative options for fixation of osteotomies and/or fractures • Expose the surgeon to new surgical techniques and the latest trends to increase the attendees' armamentarium of surgical procedures and techniques • Establish an understanding of pre-op indications and criteria for surgical procedures to improve the selection of the appropriate procedure • Decrease potential of post-op complications by increasing attendees understanding of proper surgical technique and choice of fixation • Refresh knowledge on hospital protocol for inpatient and ER patients through participation in hospital rounds • Improve practice management skills by group discussions Additional details will be posted as soon as they are available.